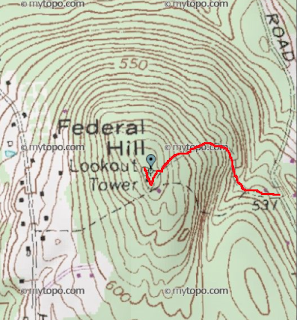 HockeyPucks hiking and highpointing: Federal Hill Fire Tower - 695 Ft. PARKING: Follow Ponemah road in Milford 1.5 miles south to the gated tower road on your right. Park road side, do not block the gate. From parking on Ponemah Road there are two trail options to the fire tower. Pass the gate and walk Tower road 100 feet. A 4x4 trail branches left or continue along the gravel fire road to the summit. The fire road is lined with mountain laurel and blueberry bushes. Follow the road (or trail) for 0.25 miles to the summit. There is a flag pole and several buildings along with a fire tower at the summit. There is a benchmark disk embedded in a cement block to the left of the fire tower steps. The summit is an open dome however tree cover prevents the good views unless you climb to the observation platform on the fire tower. Federal Hill contains one of 16 active fire towers in New Hampshire making it's low elevation a popular destination in southern New Hampshire. It's short trail distances make it a great hike for children.